Why did Edgar Allan Poe die? Edgar Allan Poe is now very well-known as the creator of the modern detective story, the master of the horror story, one of the greatest poets who ever lived, and America’s first great literary critic, but he was very underappreciated during his lifetime. Furthermore, no one really knows why Edgar Allan Poe died in 1849 at the age of 40 in a Baltimore hospital, but please check The Poe Museum: Death Theories article for a list of the published theories as of this writing. In this article, I propose a very plausible theory to add to that list. Edgar Allan Poe was still living in Fordham, New York at the time of his death, but he was in Richmond, Virginia on September 27, 1849 when he probably took a boat to Baltimore, Maryland, arriving on the 28th. He may have had money with him when he left as he was touring and raising money for his proposed magazine startup called ‘The Stylus,’ but he had no money and he was wearing clothing that did not belong to him when he was later found on the afternoon of October 3, 1849, which was an election day in Baltimore. No one, not even Poe’s relatives living in Baltimore, seem to know Poe’s whereabouts for those five days until Joseph W. Walker sent the following note to Dr. J. E. Snodgrass: “Dear Sir, – There is a gentleman, rather the worse for wear, at Ryan’s 4th ward polls, who goes under the cognomen of Edgar A. Poe, and who appears in great distress, & he says he is acquainted with you, and I assure you, he is in need of immediate assistance, Yours, in haste, Jos. W. Walker.” Dr. Snodgrass and Henry Herring, Poe’s uncle, arrive, and they presume that Poe is intoxicated. They arrange for a carriage to take Poe to the nearby Washington College University Hospital. He is placed in the care of Dr. John J. Moran who admits Poe into the part of the hospital usually reserved for vagabonds and drunkards, but he is soon moved to general care. Poe never regains enough coherence to explain what may have happened to him. According to Dr. Moran, on the night of October 6th and into the early morning hours Poe repeatedly called out the name ‘Reynolds’ though some think it may have been ‘Herring.’ Then, again, according to Dr. Moran, sometime between 3:00 AM and 5:00 AM on October the 7th, Poe awakes and says ‘Lord help my poor soul’ then dies. In March of 1847, Dr. Valentine Mott, a famous New York doctor in his day, agreed with the diagnosis of Mrs. Shew, a trained nurse who had helped to care for [Poe’s wife Virginia Clemm Poe] during her long illness, that Poe had some sort of lesions on the brain and suffered from brain fever (The Poe Log, p. 694). 1. Why, as many biographers believe, Edgar and Virginia never consummated the marriage. 2. Why Poe had so many difficulties with other ladies after the engagement. 3. Poe’s behavior (at least what we know of it) in his last nine days of life. 4. Why no one talked much about the cause of Poe’s death. The mention of syphilis is still taboo even today. No autopsy was performed, no hospital records nor death certificate are known to exist. Please check The Edgar Allan Poe Society of Baltimore: The Mysterious Death of Edgar Allan Poe article for more complete details. Poe was found dressed in clothes that were not his four days before he died, perhaps the cooping theory does hold some water for Poe was likely wandering the streets in an incoherent manner that election day, so the political hacks of the day changed his clothes and tried to get him to vote a few times. It may have been that Poe was so out of sorts that he couldn’t even vote, or another explanation I have heard is that Poe was so well recognized in Baltimore that someone finally let him go. Another fact I find interesting is that Poe was probably engaged to be married to Sarah Elmira Royster Shelton at the time of his death, but her late husband’s will stipulated that her remarriage would remove a large part of her considerable estate. 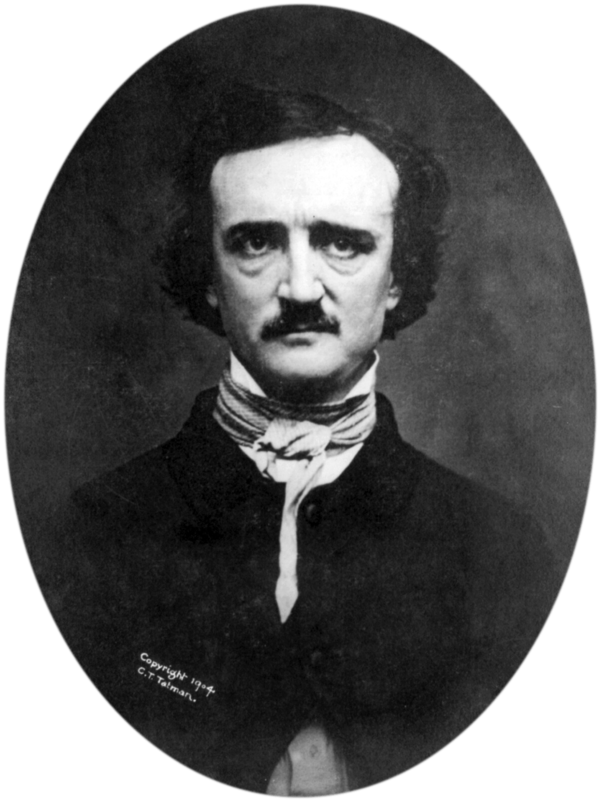 Earlier this century modern forensic detectives used a lock of Poe’s hair to rule out heavy metals like lead and mercury were the cause of death. It is very likely we may never know with certainty why Edgar Allan Poe died, but we can still have the fun of speculation and conjecture. This entry was tagged death theories, Edgar Allan Poe, syphilis, Virginia Clemm, Why did Edgar Allan Poe die.